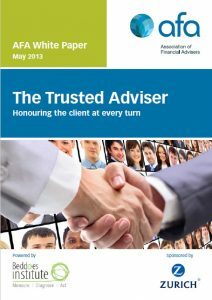 As an extension of the ‘Pathways to Excellence’ research, this white paper ‘The Trusted Adviser’, takes a deeper dive into the area that clients find most important, the qualities of their individual adviser. A central premise in this paper is that trust between an adviser and a client is vital. In the words of one client; “Trust is about caring, understanding, listening and explaining what is required”. Importantly, trusted relationships grow rather than just appear, they involve both cognitive and emotional aspects and are two way and personal.